Using my sewing and quilting knowledge to start a business. It all started with a 4 inch square coaster that I quilted. It was easy to make and I thought it would be nice to have a throw to go with it. Well, one thing led to another and before realized it, I was planning a new business. I fell in love with the flannel fabrics, especially the baby designed items and thought it would be cool to embroider something but I don’t know too many people with babies so I turned to kitchen items like towels that I could embroider. Thus, the Brother PE770 was purchased. A bit challenging at first but I figured it out. Instructions at my side, I plug along daily, learning something new every day. Youtube is also a lifesaver. Still new at it but it’s good to have something new to conquer each day. I am working on learning how to digitize embroidery patterns. Finding a program that I can easily navigate has been difficult. Let’s change that: Impossible. They are all hard. I wanted a program that would be compatible with my MAC but almost all the programs are set up for PC. I ended up buying Embird. It’s a good program but complicated. I finally conceded in buying another: PE Design Next which is in the mail to me as I type. The Youtube tutorial on it looked less intimidating. We will see. I have sewn some baby items; blankets and burp cloths and embroidered a few small items. I will post pictures soon. Also I will take a picture of my new pup. She is currently collecting rocks and putting them on the living room window sill. Strange but true. That’s it for today. Hope you all have a great day and thank you for checking me out. I have been absent from my blog for a while. I lost my sweet husband in September and haven’t been up to writing yet. I sold the home we shared in Lake Forest, California and moved into a rental house in Huntington Beach until I decided what to do next. 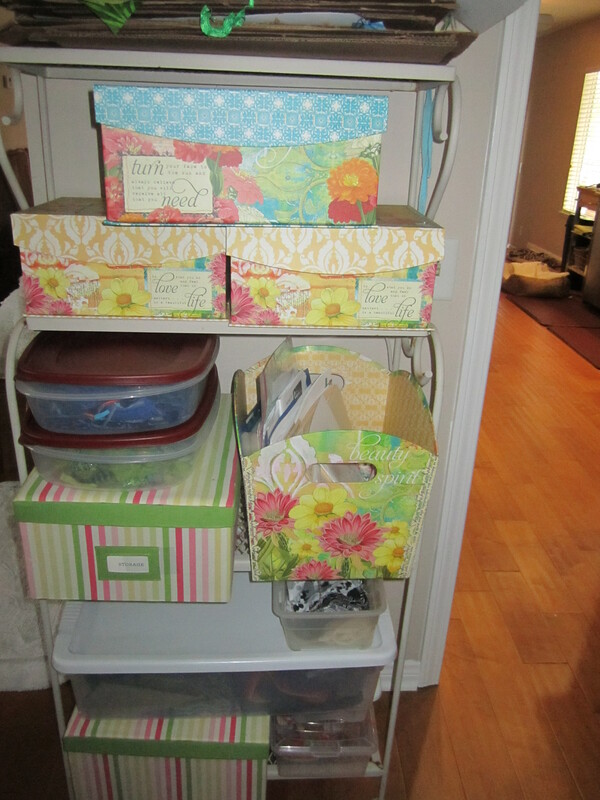 Most everything I own is packed up in plastic containers so my sewing and crafting is on hold until August. I bought a home in the Desert Hills area of Phoenix, Arizona. It has a guest house so I convinced my family to move with me so we are all starting over in the Desert. (My daughter and her husband live in the state of Washington) So it’s a real change for all of us. Mainly what I want to share today though is how much I have enjoyed reading all your blogs. Your beautiful projects have inspired my heart to return to my art projects; that is when I get settled. I hope to start responding to your blogs and writing again soon and look forward to reading your posts. 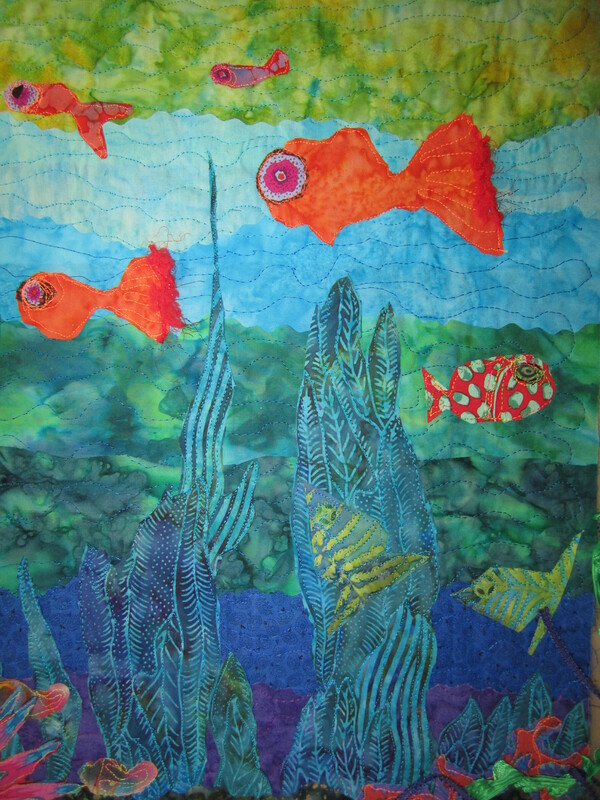 I love the fact that some very brave fabric artists threw caution to the wind and took quilting to a new level. There are so many ways available now for us to use fabric and to even make it more custom; even dye your own fabric. While I love to gaze over quilts that are made the traditional way, the perfection it takes to put one together makes me grit my teeth and grasp for air. I respect the work that goes into a complicated pattern with perfect stitching but for me, I don’t feel that bubble of excitement that I get from tossing around ideas and then using the information from the tutorials and books to make it happen. 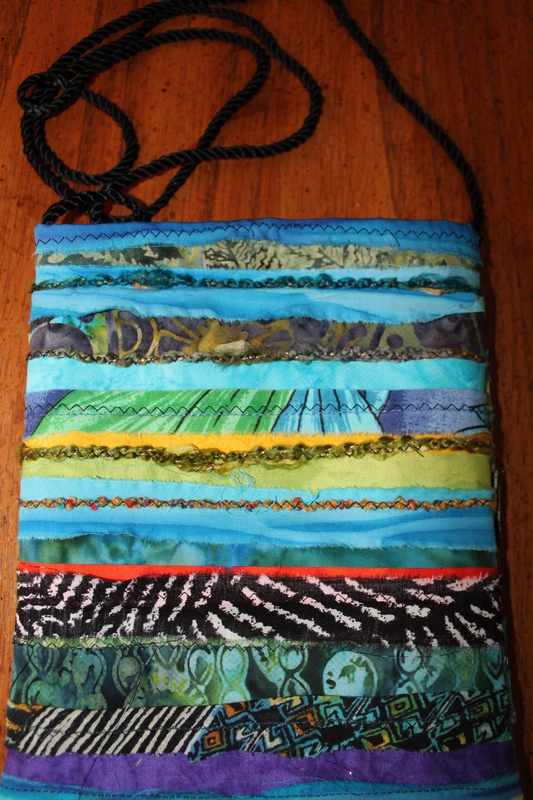 I just read a book that Alisa Burke wrote and watched her DVD called Sew Wild. I am sure her ways aren’t for everyone but for me it’s very freeing. I can’t wait to try out some of her ideas, maybe even try my hand at fabric painting. 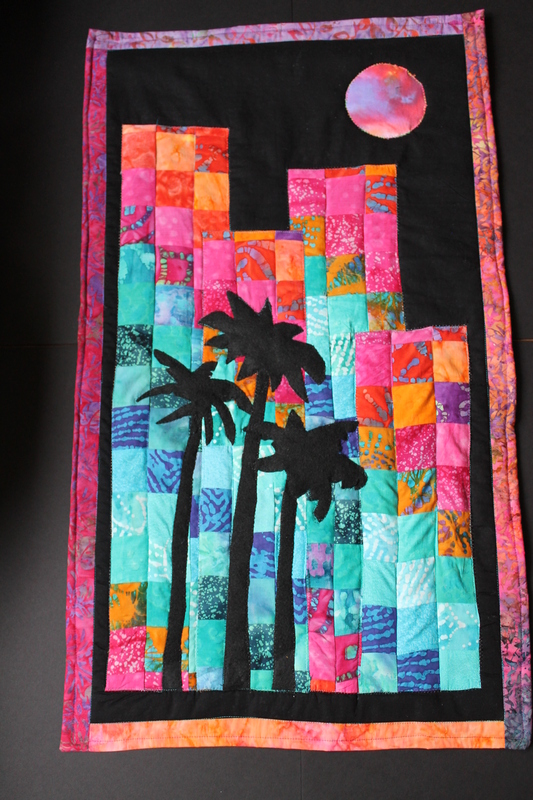 I think it’s fabric artists like Alisa that have helped bring the quilting world into the frontline of art and helped put some sizzle into the craft and through the internet we can see both kinds of quilts; traditional and rule breaking quilts. Thirty years ago our quilts sat on shelves or hopefully were used by friends and family but now they are display for the world to see and enjoy. The quilting industry has grown in response to fabric artists involvement. New fabrics, threads, sewing machines, books, magazines, classes and ways to market these items have blossomed and brought employment to people who are earning money in a craft they love. I am so glad there is room for all types of quilters. It’s brought me hours of enjoyment; I have learned how to play with fabrics and look forward to going into my dining room studio every day. 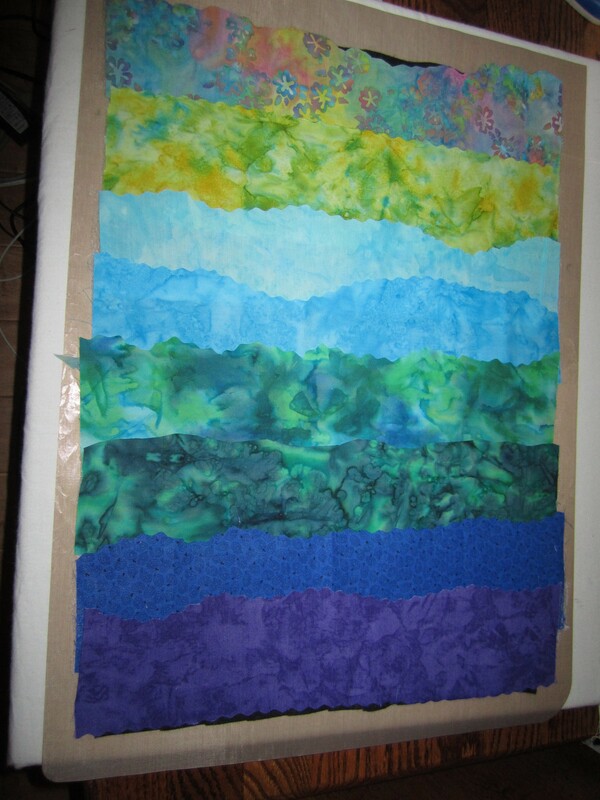 Trying out fusing to wool felt. I have been anxious to try out some techniques I learned on Interweave and Craftsy.com So here I go. 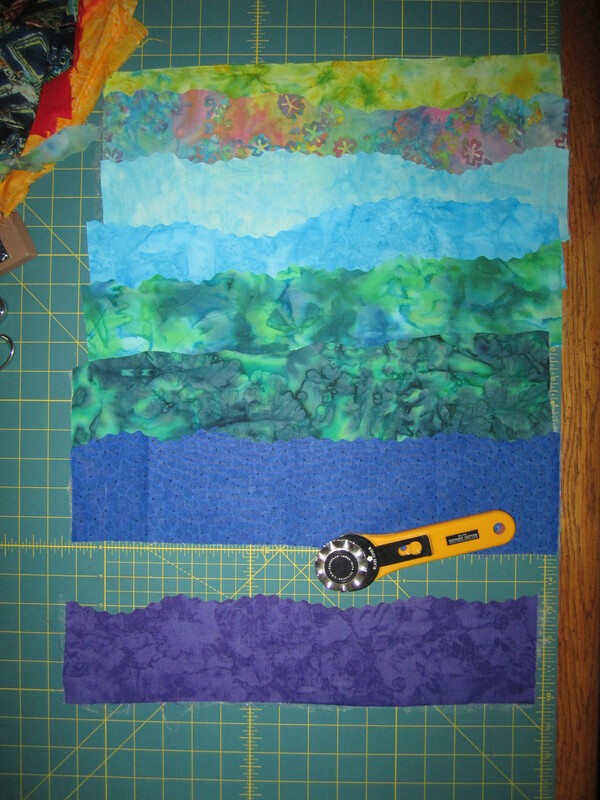 I started out by choosing and cutting out layers of perfused fabric. Quilted background. 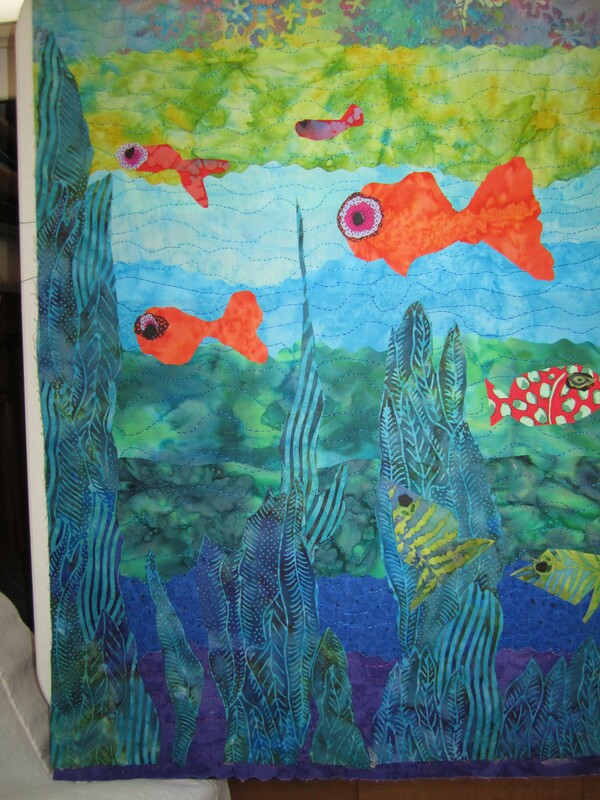 Fusing fish and pond plants. Tomorrow applique stitching and hopefully embellishments. I can see I need work on my camera skills. I am so fortunate to have my dining room to use as a craft area. 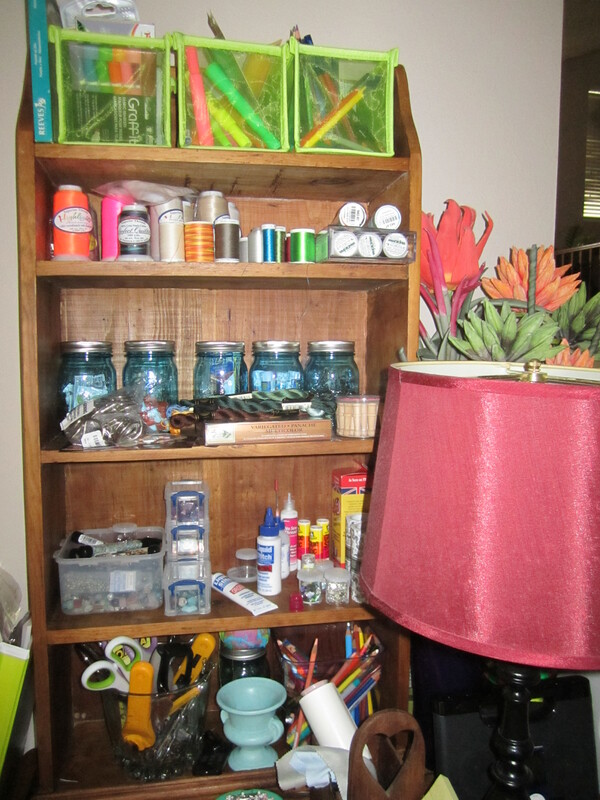 I am not really a tidy person so I am surprised to find myself so interested in organizing my studio. I can only think that it’s a product of necessity. After spending a lot of time searching for fabrics and tools I realized that I could get projects completed with less frustration if I put things in order. Just a touch of yellow. Have you ever really thought about why you like that cute little yellow house on the corner or the one yellow plant in your garden that catches your eye every day? I think it’s because it makes you happy. My mom did her whole bedroom in yellow. Overdone, I thought. Yellow wallpaper, yellow bedspread and she even had orange and yellow shag carpeting throughout the entire house. Crazy! But, she loved it and I am starting to see why. I have noticed that when I add just a touch of yellow, it makes the quilt come alive and draws your eye in. The sun gives us light and warmth and life. The same applies as we create a quilt. Of course not all quilts would look good with splashes of yellow but a highlight of some sort will set a quilt apart from the rest. It could be the color red or orange or a special pattern that accentuates the color contrasts. 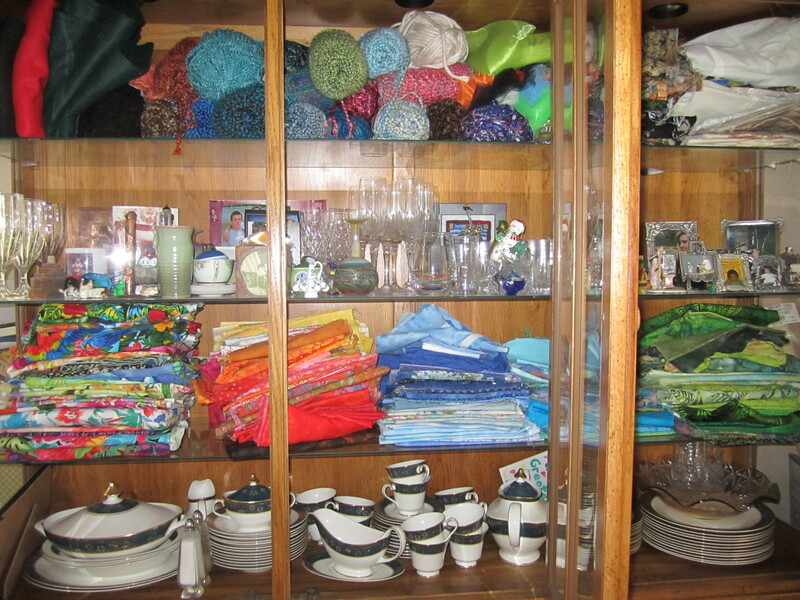 Okay, I admit, I am a little color crazy. Probably over the top but it cheers me up. Blame it on my mother. She was unique, colorful and would wear just about any color or style. She had eyeglasses that flared up at the corner, with rhinestones. I miss my crazy mom. 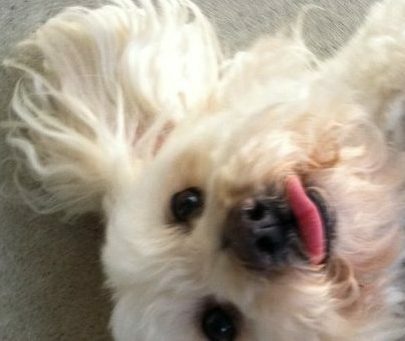 She had Alzheimer’s the 20 years of her life but everybody still loved her. She looked for the good in people and people saw the good in her. I hope I am just like her. 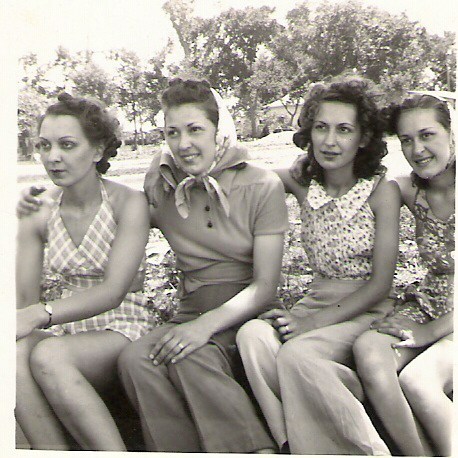 My mom is 2nd in from right. As I was searching for tutorials on bindings, I ran across a few websites that did not want their information copied in any form and it caused me to look at the copy write laws in regards to exactly how it applies to the art craft industry. If you buy a pattern, make the project from the pattern and then sell it, you probably are infringing on copywriting laws. You can copy projects for your own use or to give as gifts but you cannot sell them. They need to be your own work, coming entirely from your own inspiration. So get ideas from patterns but don’t copy unless you have permission from the owner or it is a copy write free or it’s public domain. Patterns issued before 1923 are generally considered public domain. Most artists don’t have a problem with coming up with their own ideas and inspiration; that’s what make this craft so enjoyable. Coming up with new ideas. The best part of a project is when that spark lights and you start jotting down that inspired thought. As beginners, we need to glean through the tutorials and projects to get the structural “how to make it” ideas and then learn to combine those thoughts into your own creation. Where do you get your best inspiration from?